This is a small species of fish that is often misidentified as juvenile Dorado (Mahi Mahi). It is in fact a different species known as a Pompano Dolphinfish. They are smaller than their Dorado cousins but also travel is schools. One way to identify the species is by the long dorsal fin which extends the length of their whole body. 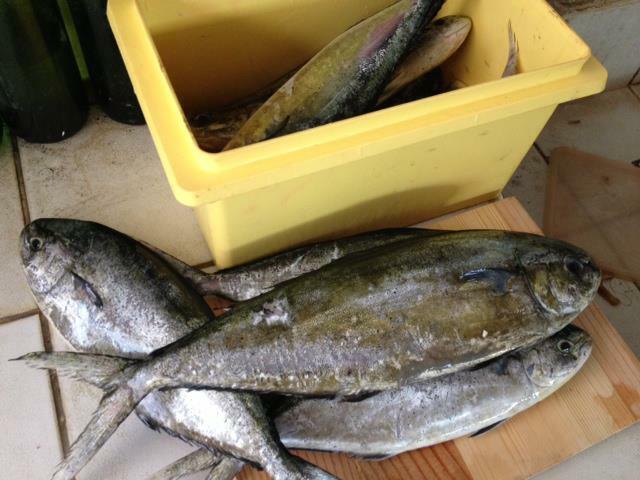 These were caught off of Dumaguete by angler Mike and his companions while they were fishing around FADs or payaw. These fish were in a feeding frenzy and Mike related to me that they were hitting just about every lure that was thrown at them. Over 40 fish were caught in an hour. So next time you are out hunting around payaw and come across “baby” Dorado, take a closer look at it and see if you have a Pompano Dolphinfish. These are an excellent food fish tasting like Dorado, but sweeter according to Mike. Posted on March 20, 2013, in Mahi Mahi (Dorado), Pompano. Bookmark the permalink. Leave a comment.